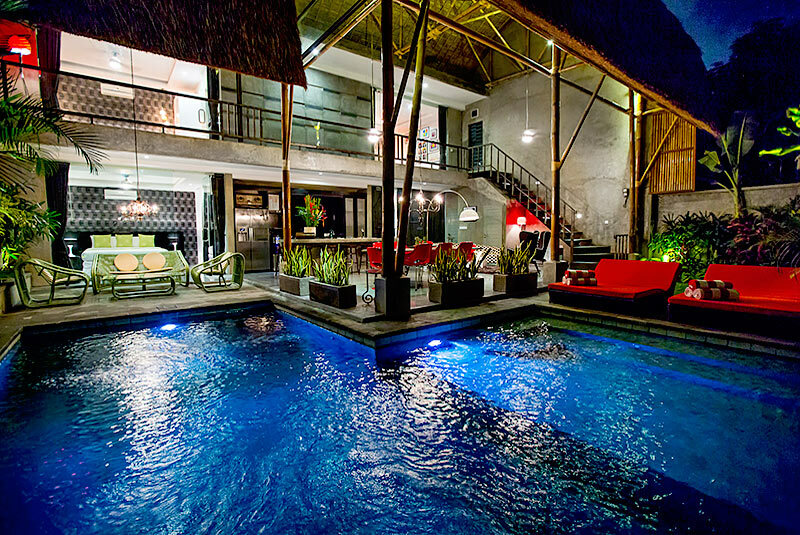 From $ 864AUD per night We have direct contracts with most villa owners. We don't add any booking fees. We are 100% transparent with no nasty surprises. 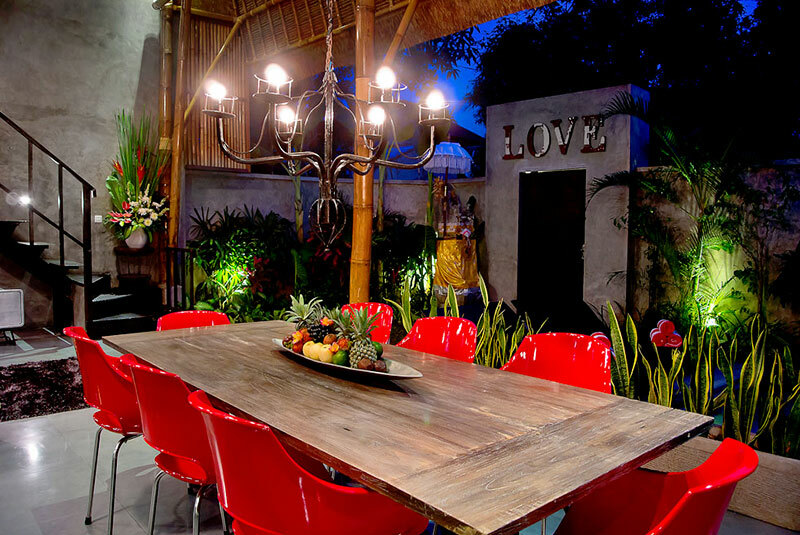 Top location close to 'Eat Street' in Seminyak - rent this now! 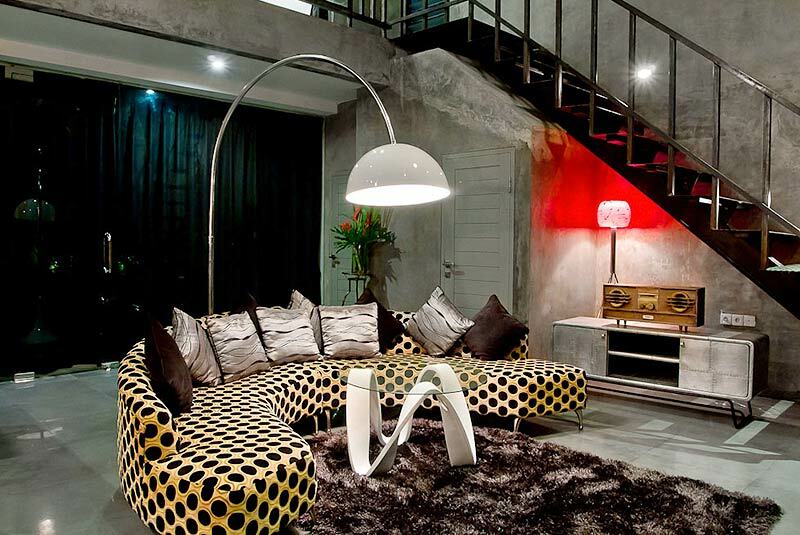 Villa Esha II is a tropical fusion of contemporary design with traditional Balinese architectural overflows. 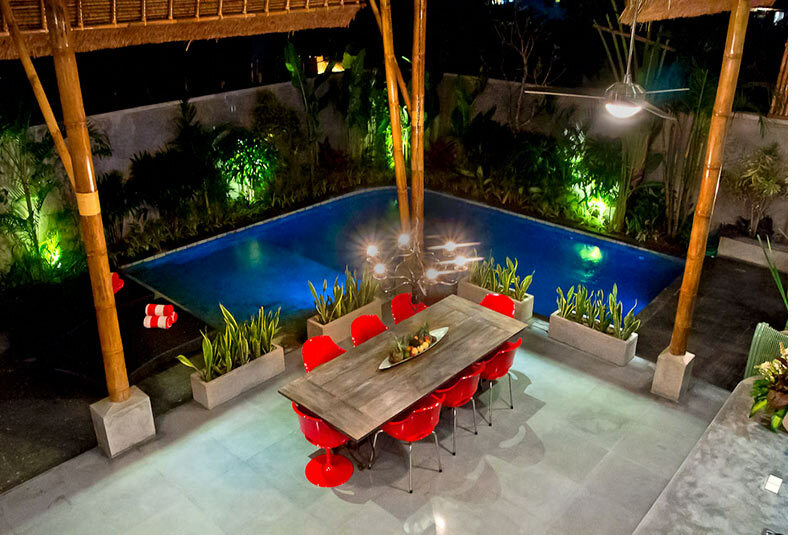 This 4 bedroom holiday villa rental in Seminyak is serviced by friendly Balinese staff, its strategic location just a few hundred meters from Jalan Oberoi makes it even more appealing. 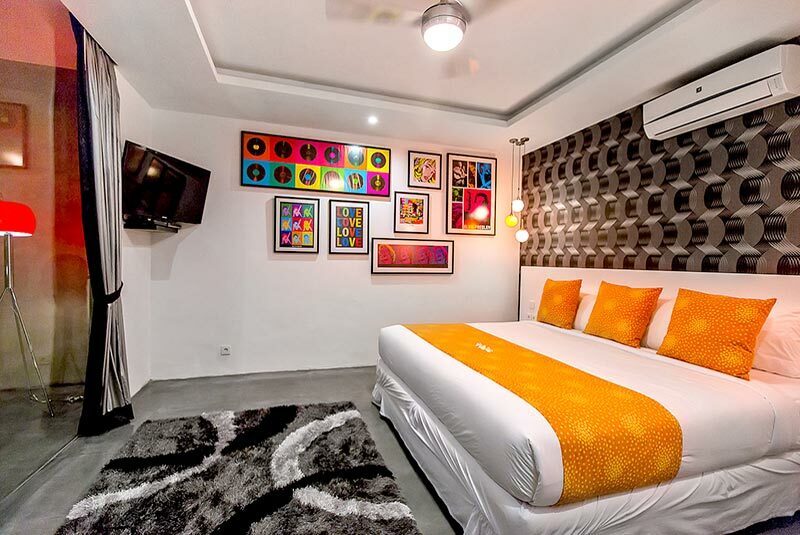 Four bedrooms offer very comfortable accommodation for up to 8 guests, however it can be rented with the adjoining Eshina Villa to provide a 7 bedroom option, ideal for families and groups of friends alike. The swimming pool is crystal clear, its L-shaped design provides a deep section so you can dive straight in to cool off and a shallower section perfect for younger children. The staff can arrange a pool safety fence before your arrival if you are traveling with young children. Double sized rattan sun beds with fresh soft beach towels and the smell of coconut tanning oil will set you into holiday mode immediately. 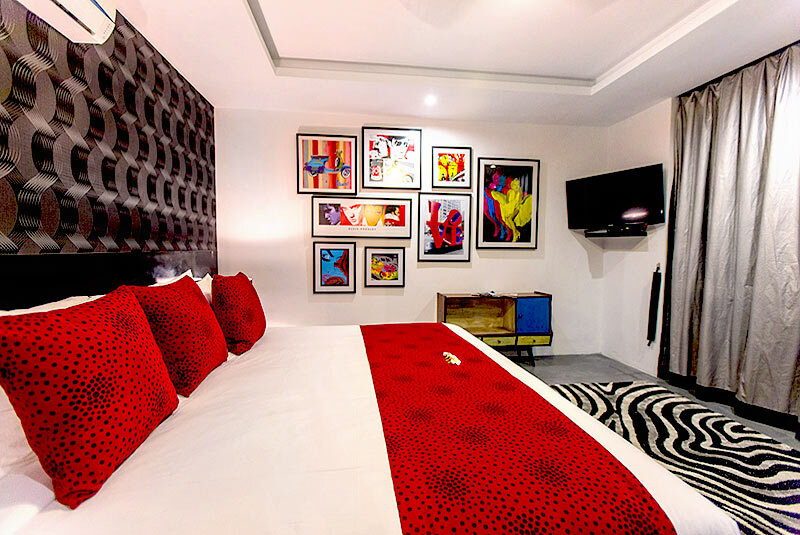 The villas interior retro design and vibrant furnishings give it a stylish and unique aspect. 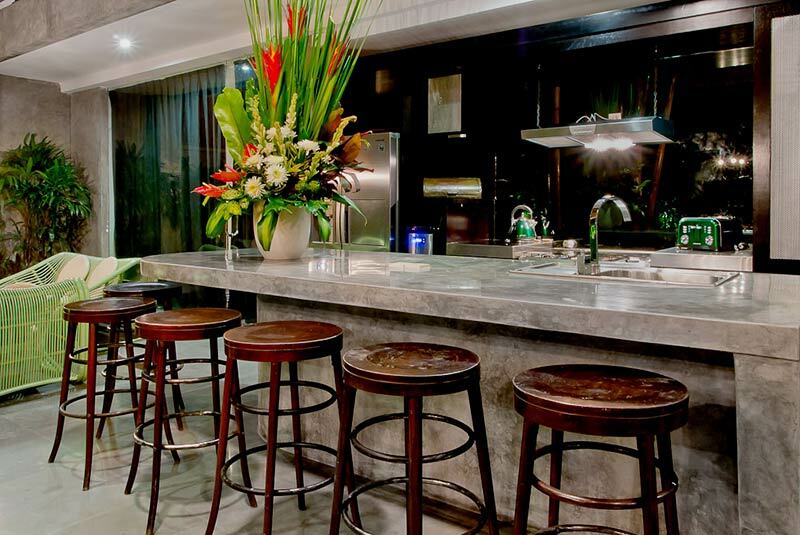 The use of polished cement offers a cooling element to the open-air tropical living space adding a chic industrial design element as well. 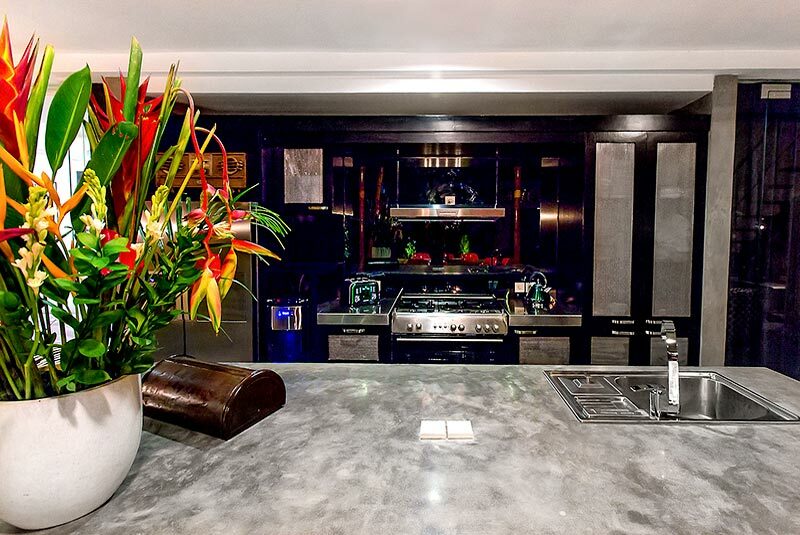 Red is the colour of choice with shades of black, the modern kitchen’s island bench done out in polished cement has 6 bar stools so you can gather here for breakfast and offer cooking tips and dinner time. 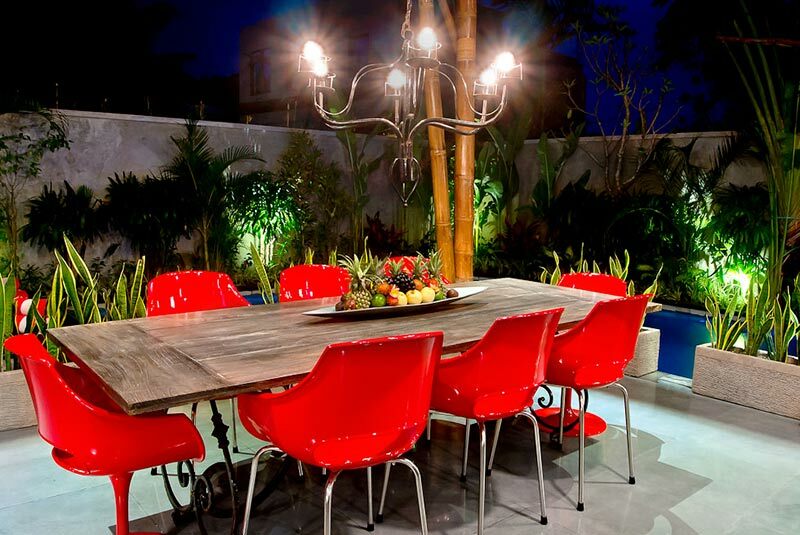 The rustic timber dining table seats 8 with vibrant red designer chairs and a half moon lounge offers a relaxing spot to enjoy some TV. 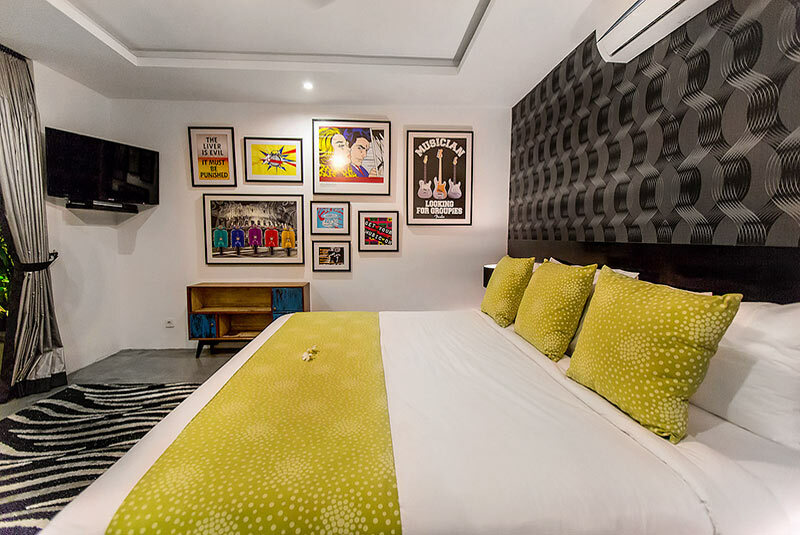 The two master bedroom suites are located on the ground floor with large doors opening to the pool area, both featuring super sized king beds with chic modern art adorning the walls. 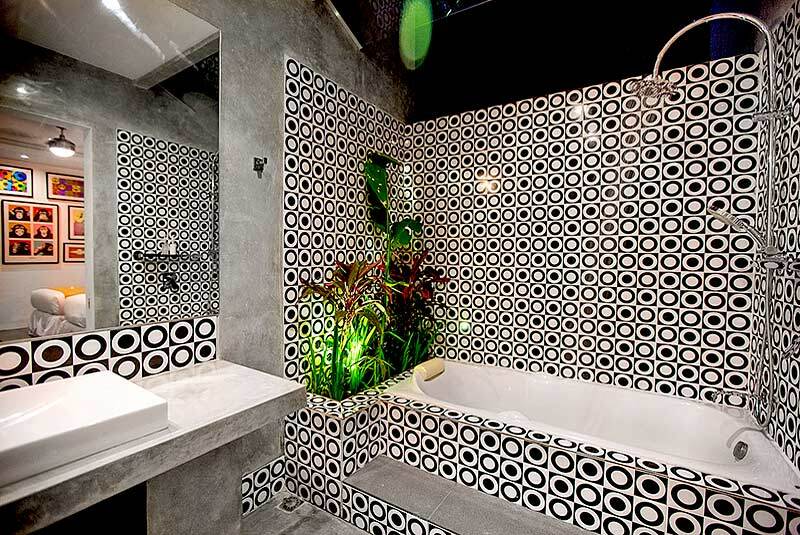 The en-suites boast soaking tubs and rain showers and fancy art on the walls. 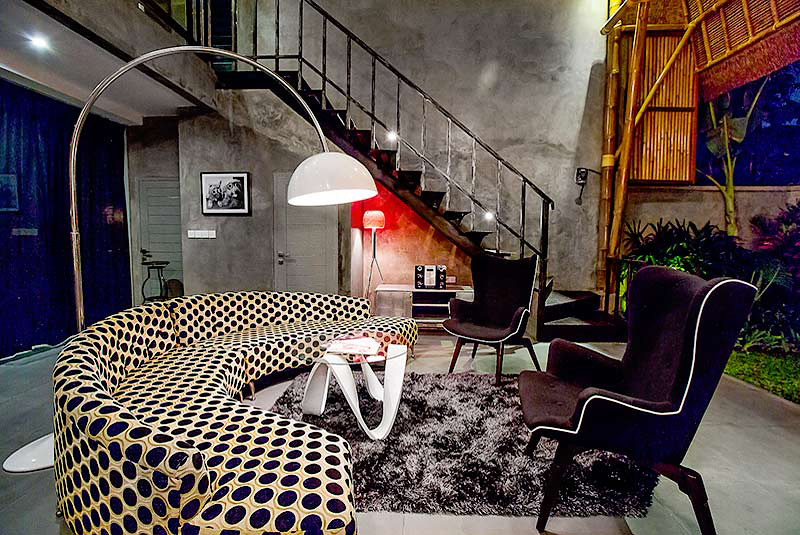 An industrial inspired staircase lead you to the two guest rooms, one with a king size bed and the other twin beds each with private en-suite. 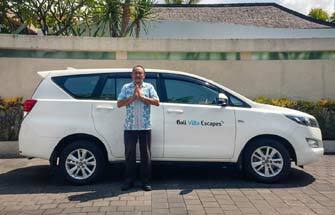 The staff at Villa Esha II are going to make your holiday even more enjoyable, they will attend to your every need, whether it be providing extra catering services, arranging transport, offering local advice, providing babysitter and in-house spa services. 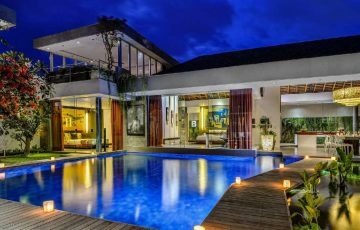 The villa is perfectly located just a few hundred meters from the Corner Store on Jalan Oberoi, ‘Eat Street’ which is where all the most popular restaurants such as Ultimo, Mama San and Mykonos are located. 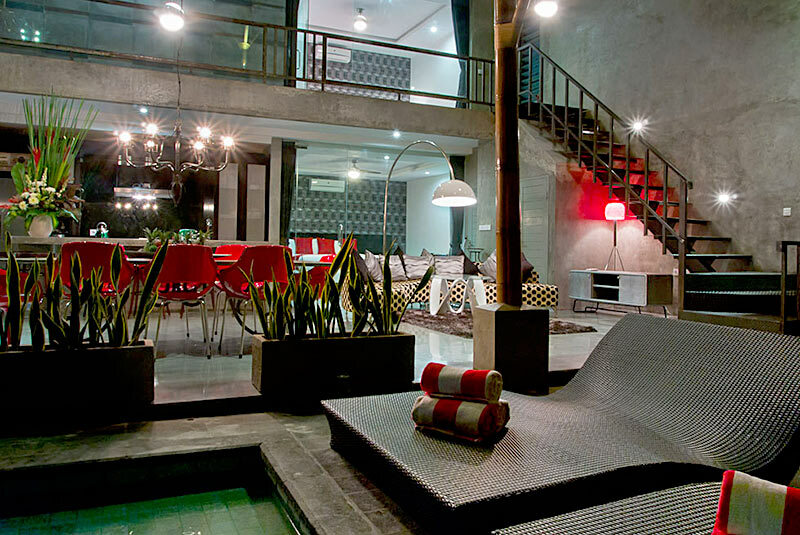 Here you will find a couple of great night spots including La Favela, Red Carpet and Motel Mexicola. 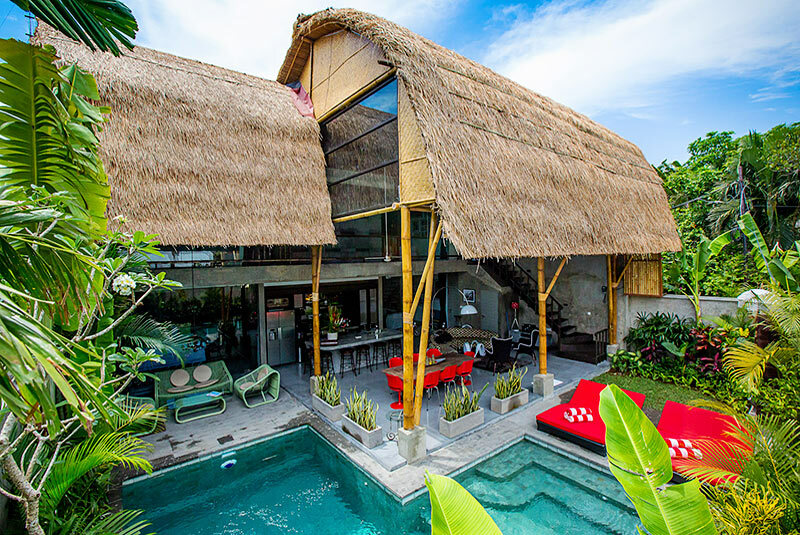 You can walk to Seminyak Beach and the famous Ku de ta Beach Club where you can swim, surf, people watch and sun bake all day long. There are lots of other restaurants & cafes if your coming with children and are looking for affordable, family friendly eating options (Hanks Pizza, Johnny Rockets, Happy Chappy’s Boss Man Burger & Sisterfields). 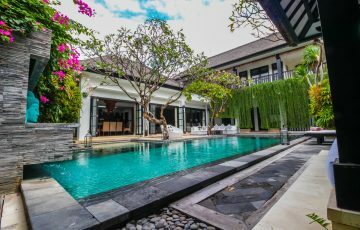 To view other Seminyak villas or our full range of family friendly holiday Bali villas please browse this website or contact our reservation team. 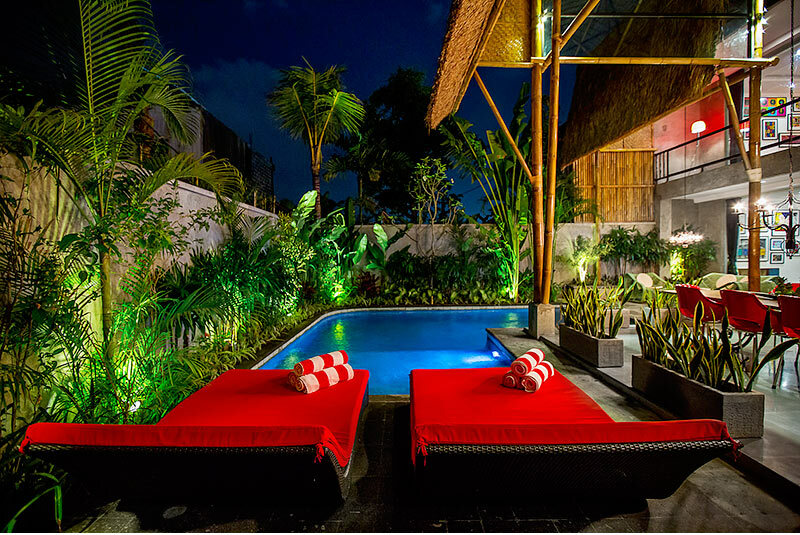 This is a popular villa to rent in Seminyak so if your planning a trip to Bali, especially during the Australian school or public holidays please book Villa Esha II well in advance. Rates are including tax & service charge. 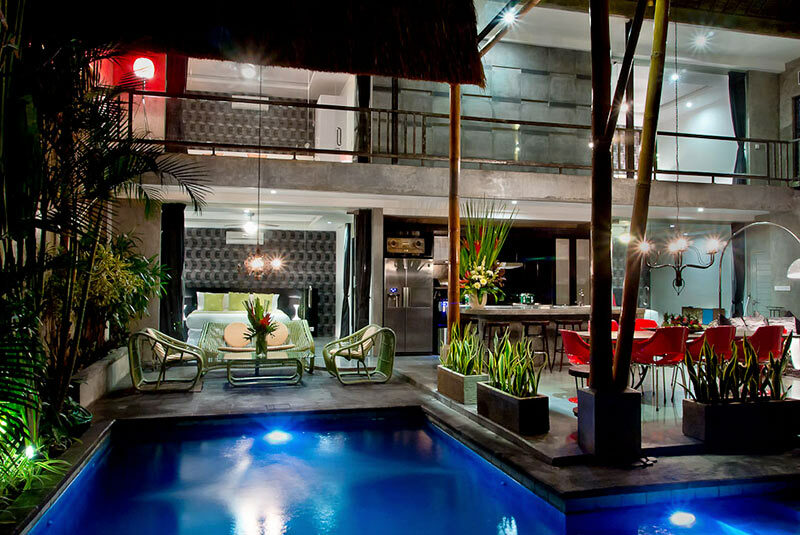 Loved this villa and it's fabulous Seminyak location. Easy and very handy to get to all the restaurants nearby which was great as we were travelling with 3 children. 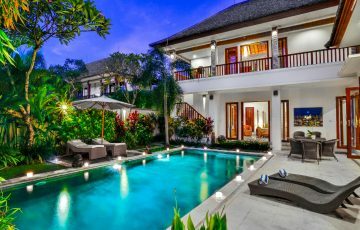 For the price, swimming pool and facilities this is really a good holiday villa and highly recommended. 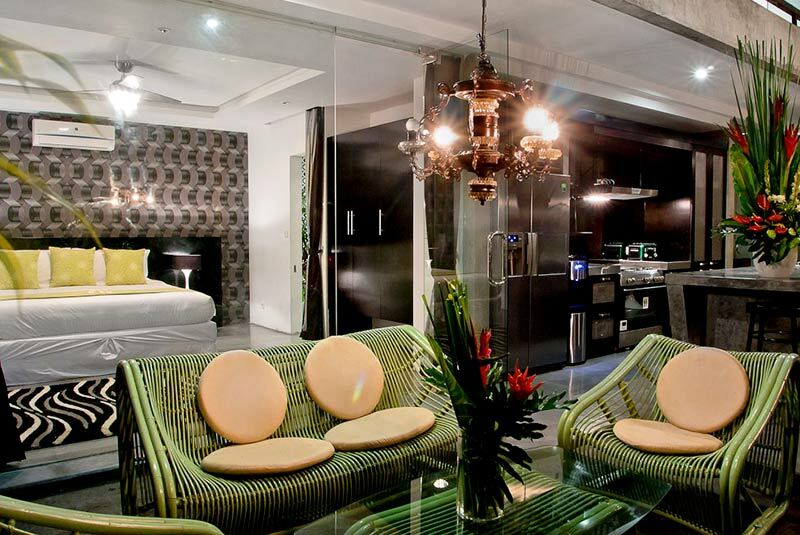 Clean, comfortable with a lovely, relaxing ambiance. Perfect for a few days. Central location with friendly staff. 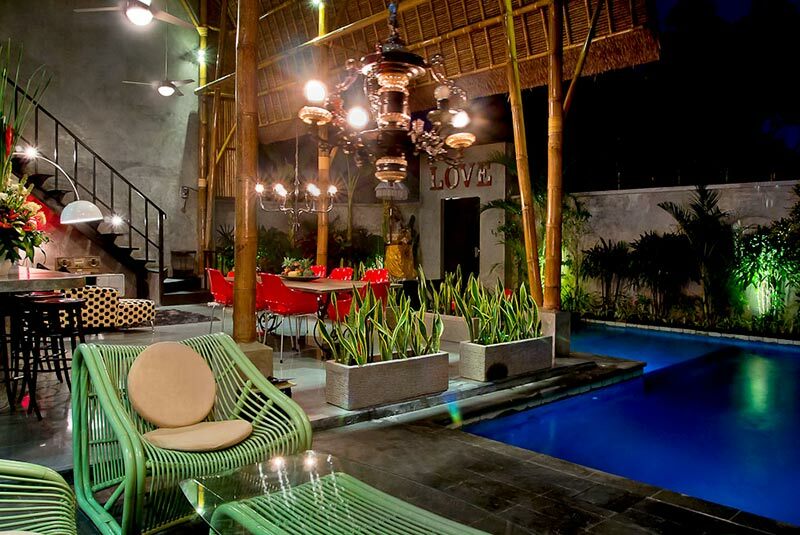 As regulars to Bali we will certainly be coming back to this lovely place. For the price per night we were really happy with this villa. Such a great location and ideal for our family. 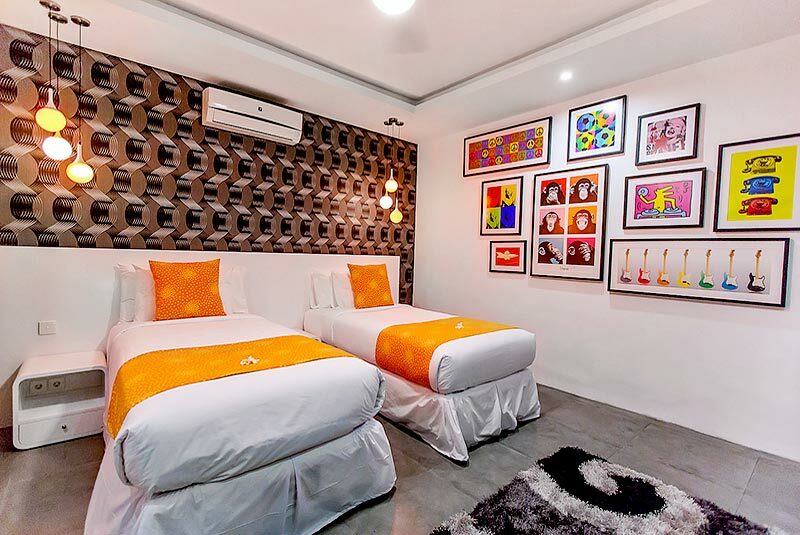 Getting anywhere like the Splash or Waterbom park for the kids was really easy as there were always taxis nearby and there were also so many fab restaurants nearby which meant going out for dinner was not a hassle. 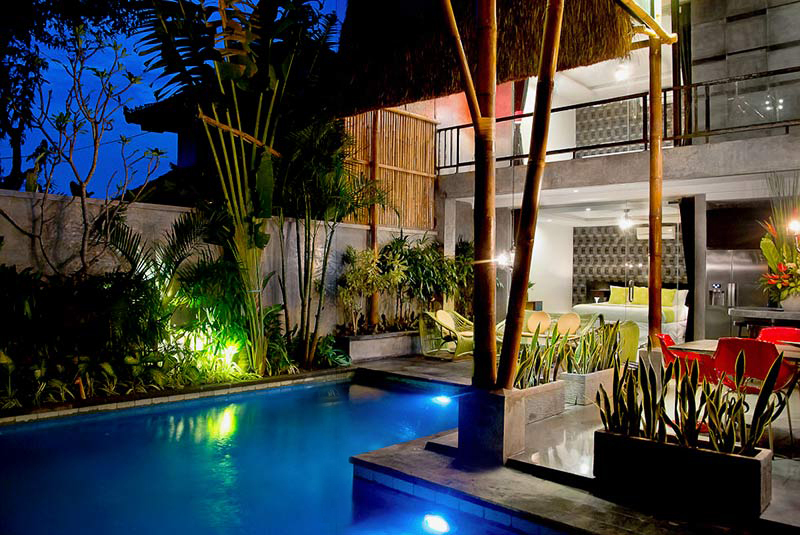 Clean, modern with a great pool. 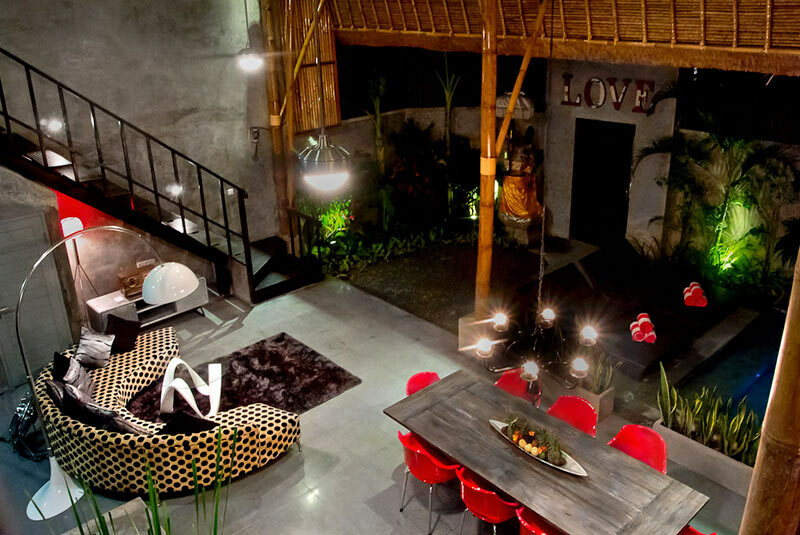 Authentic villa with a lovely feel - kids loved it and so did my husband. Such a handy location as well. I am so pleased we found this place. Happy staff with breakfast every morning. Total holiday bliss! To everyone at Villa Esha you were so wonderful and thanks for looking after our family so well. Loved our stay.